2Red Casino’s popularity skyrocketed shortly after its establishment in 2002. Today, its one of the most recognized online casinos, especially on the UK market. 32Red Casino has a distinctive design that contrasts red to white. The site’s layout is easy to work with. Players are greeted with a list of games from which 26 are blackjack variants. On top of the unusual welcome bonus (deposit £20 and get £32 up to £160) you can enjoy weekly and monthly bonuses. The daily Live Blackjack Bonanza was crafted exclusively to blackjack players, providing a chance to collect £10 for every blackjack gold card. 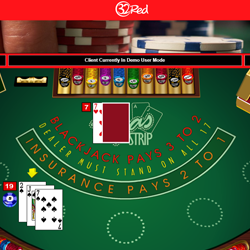 Your regular 32Red Casino is available in browsers on all platforms. However, the no-download casino offers a limited game selection, hence the downloadable casino – with a wider range of games – is named Premium Casino. Both are powered by Microgaming, therefore the quality is topnotch. Over 26 varieties of blackjack are available at 32RedCasino. Single and multiplayer, Vegas and Atlantic City rules, Bonus Blackjack, Triple 7’s, Double Exposure, Pontoon, Spanish, Elimination, High Streak, Super Fun 21 – the list just goes on and on! All the rule variations you can think of are available here, along with some varieties that you’ve probably never played before. Very few sites offer as many blackjack games as you will find at 32 Red Casino. 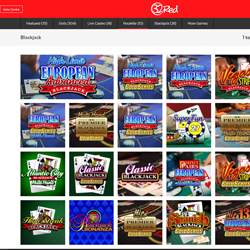 Offering over 600 other games, 32Red Casino gives players access to an incredible amount of variety. All the games look amazing, thanks to Microgaming’s experience and professionalism. Players have access to the usual game categories – lots of slots and progressives, table and card games, plus bingo, keno, video poker, and more. The live casino is not the biggest on the internet, but its selection covers all the basics, such as roulette, blackjack, and baccarat. The startup bonus at 32RedCasino gives new players £32 free for every £20 they deposit, up to a max bonus of £160. Monthly top up bonuses offer similar deals, helping players keep their accounts full. Weekly promos and occasional tournaments add more action to the mix. As for a loyalty program, the famous Ruby Rewards program fills this role very nicely. VIP players get invited to Club Rouge where even more benefits await. Blackjack players can enjoy the daily Live Blackjack Bonanza, and collect £10s with every gold cards (2PM – 1AM UK time). 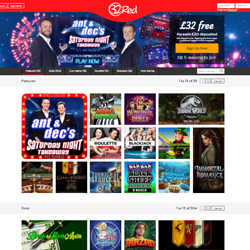 32 Red Casino has a lot of good selling points, and it scored well in all of our categories. It is a greatsite for blackjack, with over 26 variations offered. The bonuses are are strong and frequent, the promos offer lots of fresh ways to win, and the loyalty/VIP benefits offered by the casino are top-notch. 32Red is a big name in the online gaming industry, and it’s easy to see why.